HOLI COLOR FUSION is an initiative of bringing together individuals, families , friends and adding music, food, colors to this amazing festival. Holi Color Fusion will have a Flea Market, Food Court, Pool, Rain Dance & Music to add rhythm to all. 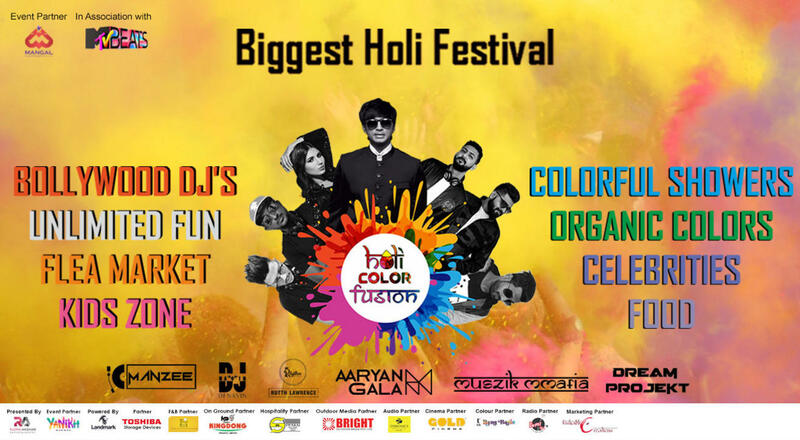 It is happening at the prestigious Korakendra Ground they have been hosting the biggest Navratri in Mumbai since the last 10 years, HOLI COLOR FUSION will be the biggest Holi festival this season. With a powerful DJ line-up we also have crowd engaging activities open to all generations. Known for his versatile sense of music he is one of the most featured upcoming DJ in the town With his passion for music and his style of juggling beats he pumps up energy in the crowd and keeps their feet cracking the floor. A man who has stormed over 40 counties last year with his energy and madness . Over 2000 shows , worked with the best actors in bollywood and has performed with nucleya and many more dj’s pumping up thousands of people worldwide . This guy was tagged as "THE DJBOY". When he started doing Djing of some bollywood parties using a beginners player, 6 years ago. His love for Bollywood music grew up since then. At a very young age of 14 Manzee started to understand what music is all about. He is full of skills when it comes to playing live, with a lot cultural festivals and clubs Manzee has also played at Star Parivaar Awards. With his vast collections of Bollywood Beats he is sure to make groove on the dance floor.